I would give my left arm to be transported back in time to this place! 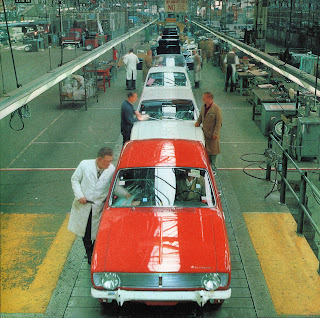 ;) This has to be Ryton Assembly Plant in Coventry since Arrow production moved to Linwood, Scotland in 1969, this photo I believe was taken in 1967. Great photo - looks final inspection with plastic seat protectors and white-coated inspectors. Agree Ryton as most likely. Date is slightly confusing if red one is a Hunter. Sceptre introduced Sept 67, at the same time (within a week or 2) as Hunter got the revised grille with rectangular lights. Other possibilities are US Sunbeam Arrow (as you say) or Sunbeam Minx for export (which might have had over-riders as part of the non-UK spec) The presence of Estates is not a problem as they started April 67. So it could be (1) a very precise date of late Sept 67 with one of the very last round light Hunters (2) slightly earlier Aug/Sept 67 with a pre-production Sceptre (perhaps parked there as a familiarisation sample for workers to check and confirm what new bits it contained) or (3) normal assembly late 67 onwards to 1969 with a Sunbeam Arrow or Minx. 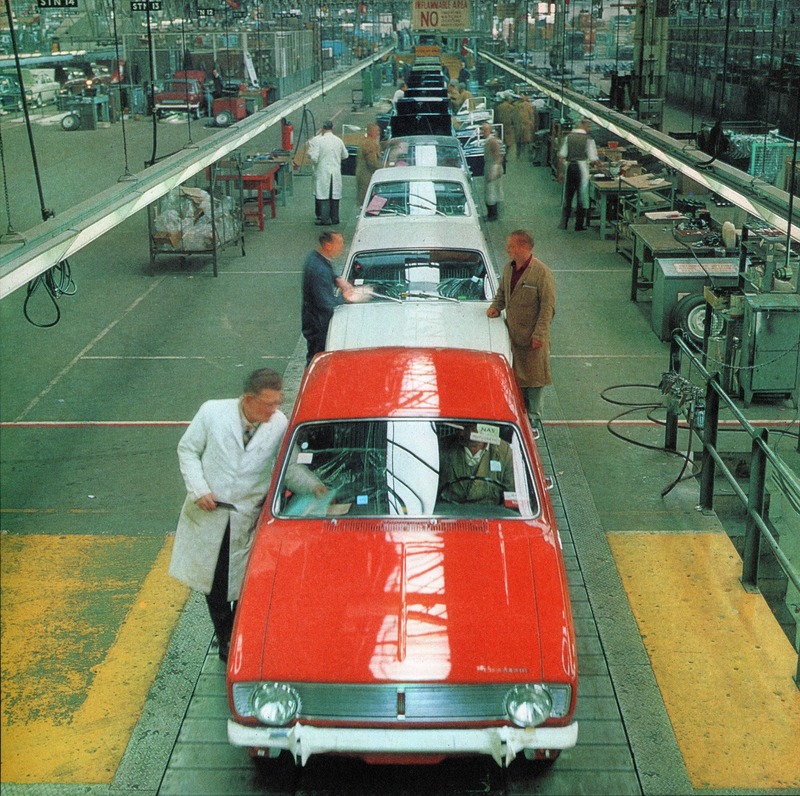 I've seen LHD/RHD along with different trim mixtures on the same assembly line at Vauxhall (Cavaliers and Opel Asconas) and Austin (Minis, Allegros) in the 1980s, so not uncommon. If this is the inspection area, it may funnel and process cars from several lines at one exit point, so mixture is inevitable. shahin,you do not need to to give your left arm to go back in time,we can go together in my de lorean&bring two of those back&my dmc can stay there as it spends more time in mechanic shop than being on the roadby the way the red car can not be sceptre bkz of single head lights. Sceptre is distant background left, with rear visible. How big's the boot on your DMC - can we fit in a Singer Chamois Sport or a Sunbeam Stiletto as well please?